March 3, 2006: Backyard astronomers, grab your telescopes. Jupiter is growing a new red spot. The official name of this storm is "Oval BA," but "Red Jr." might be better. It's about half the size of the famous Great Red Spot and almost exactly the same color. "The oval was white in November 2005, it slowly turned brown in December 2005, and red a few weeks ago," reports Go. "Now it is the same color as the Great Red Spot!" Curiously, no one knows precisely why the Great Red Spot itself is red. A favorite idea is that the storm dredges material from deep beneath Jupiter's cloudtops and lifts it to high altitudes where solar ultraviolet radiation--via some unknown chemical reaction—produces the familiar brick color. "The Great Red Spot is the most powerful storm on Jupiter, indeed, in the whole solar system," says Orton. The top of the storm rises 8 km above surrounding clouds. "It takes a powerful storm to lift material so high," he adds. Oval BA may have strengthened enough to do the same. Like the Great Red Spot, Red Jr. may be lifting material above the clouds where solar ultraviolet rays turn "chromophores" (color-changing compounds) red. If so, the deepening red is a sign that the storm is intensifying. 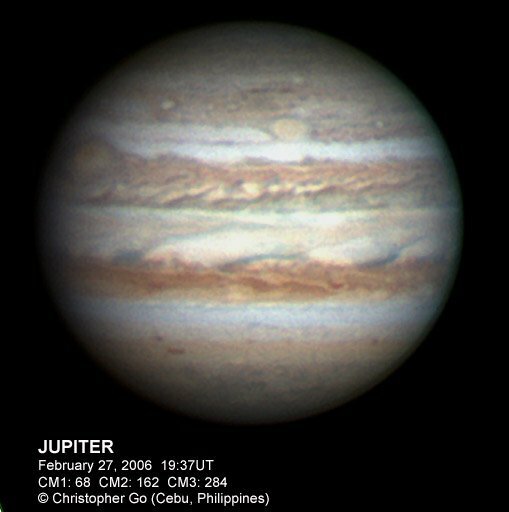 "Some of Jupiter's white ovals have appeared slightly reddish before, for example in late 1999, but not often and not for long," says Dr. John Rogers, author of the book "Jupiter: The Giant Planet," which recounts telescopic observations of Jupiter for the last 100+ years. "It will indeed be interesting to see if Oval BA becomes permanently red."
. Jupiter outshines everything around it. Small telescopes have no trouble making out Jupiter's cloudbelts and its four largest moons. Telescopes 10-inches or larger with CCD cameras should be able to track Red Jr. with ease. What's next? Will Red Jr. remain red? Will it grow or subside? Stay tuned for updates. Storms Collide on Jupiter -- (Science@NASA) The Hubble Space Telescope captured dramatic images of storms on Jupiter as they collided to form a truly titanic tempest. -- Jupiter is easy to find in the morning sky. It is pleasing to look at with the naked eye and even prettier through the eyepiece of a small telescope.